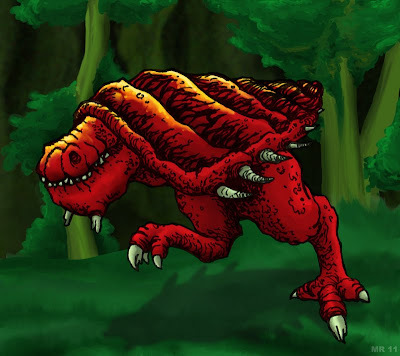 The Diphiladons are enormous dinosaur-like creatures that have recently been discovered in a secluded volcanic valley in central Africa. They stand 10 m. (30 ft) at the shoulder. The eyes are on stalks as to see above foliage for prey. The Skivviywik is a bizarre mutant created from the detritus of other experiments. 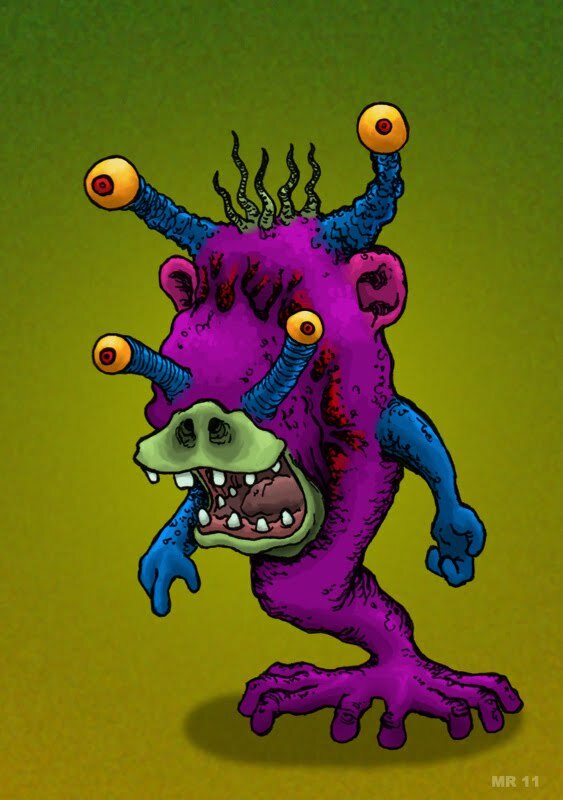 A strange electrical surge into a bio-vat containing a primordial soup of fish, monkey, tube-worm, and mollusk DNA spontaneously generated the strange creature. After an initial period of confusion and violent outburst, the Skivviywik went on to earn a doctorate in theoretical physics and now servers a high position with a government contractor making advanced particle weapons and propulsion systems. 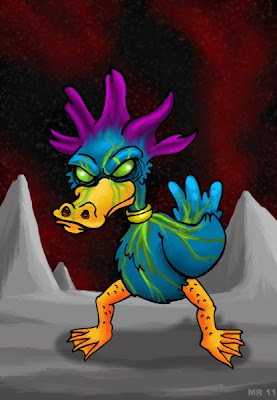 Cosmic Ducks are a race of higher dimensional beings who roam the universe, protecting the innocent and preserving sentient species from extinction. They are in fact descended from a flock of normal terrestrial ducks who were caught in a temporal vortex while migrating over the Bermuda Triangle. The strange extra-dimensional energies rapidly evolved the quacking avians into higher life forms that possess vast psionic powers. Cosmic Ducks take special care to isolate the Earth from terminal threats in the Galaxy. In Frank Herbert's The Jesus Incident, Hooded Dashers are large, powerful predatory animals on the surface of an alien world called "Pandora." They are at the top of the food chain, but like all creatures on Pandora they are subject to the collective entity known as "Avata." Cheese Ghosts are a creation of a mad wizard as a practical joke. They can be eaten by a certain round yellow creature without first eating a power pellet. 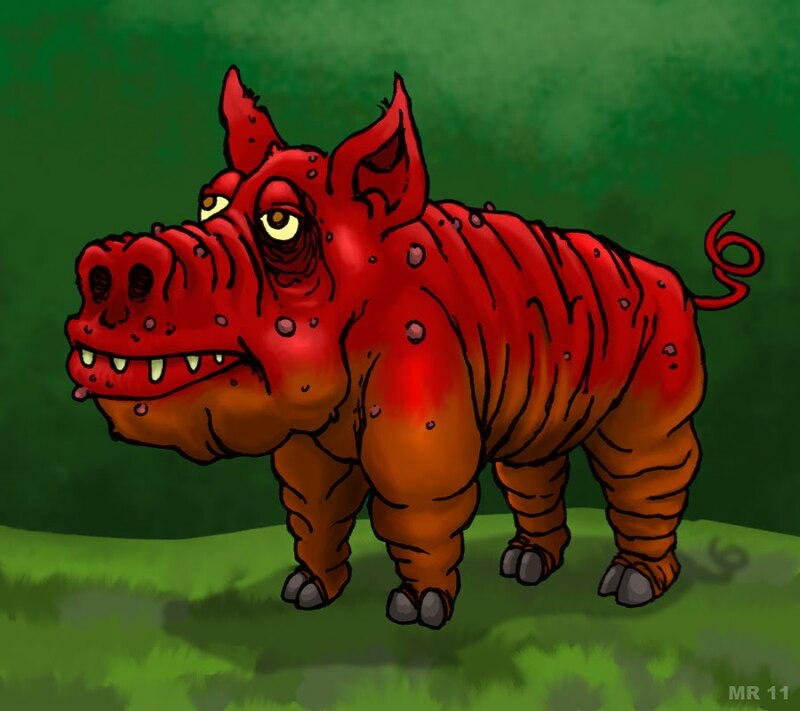 Qhosrt are a type of animal which evolved in a steamy, jungle environment. The eyes are situated on fat, semi-flexible stalks which look out in opposite directions for oncoming prey, while the mouth is positioned above to feed on hanging branches and leaves. 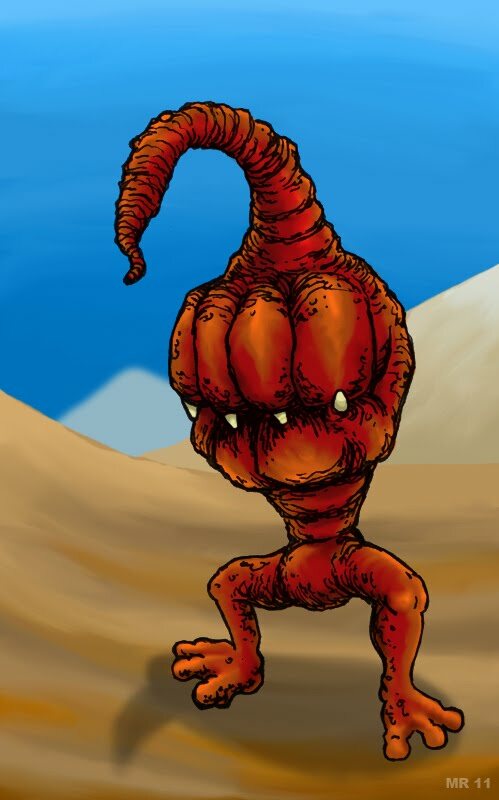 Qhosrt are capable of eating nearly any kind or organic matter, and have been domesticated as pets and pack animals by many different space faring species. 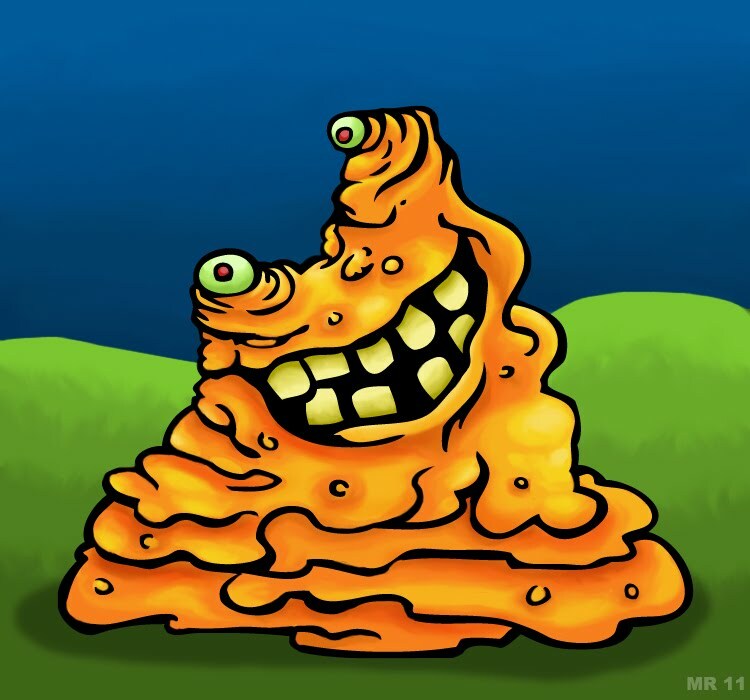 The Chlob is a hideous mutant, formed from the result of ingesting radioactive cheese dip. Samuel P. Bronkowitz was a lonely child, who's only joy in life was a passion for video games. One lonely Friday night during a particularly heated exchange on his favorite MMORPG, Samuel partook of the aforementioned radioactive dip. Samuel's body began to change and liquefy, turning into a bright orange, cheesy substance. Samuel immediately vowed to use his great powers for the protection and betterment of mankind, but still spends a significant amount of his time playing video games. 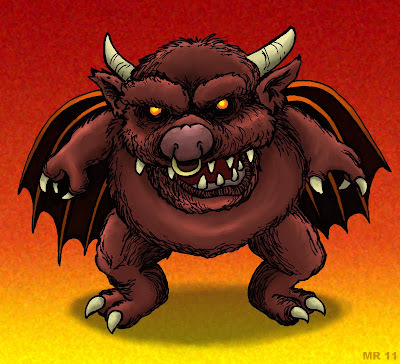 Pildemus are small, hairy demons. 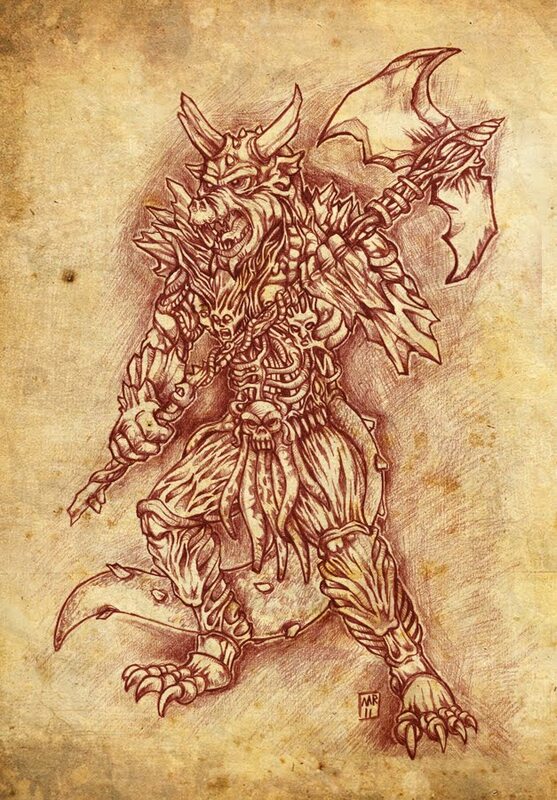 They are physically weaker than most other demons, and are generally bullied and/or fulfill subservient roles, such as footmen, assistants, advisors, or court jesters. 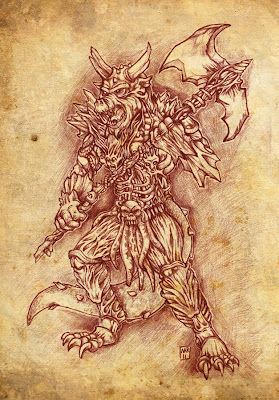 Pildemus demons are unusually adept at dark magics and powers, and often manipulate their "masters" for their own gain. 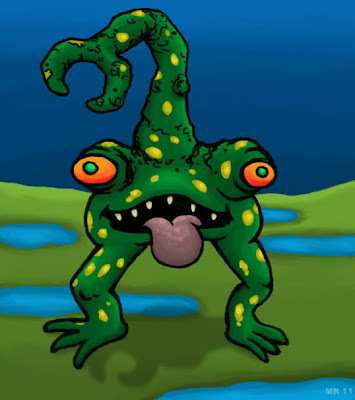 Claw frogs are large, carnivorous amphibians. The front limbs have atrophied, and instead a large clawed forearm extends from the top of the creature's head. This claw is used for hunting, defense, and mating purposes. 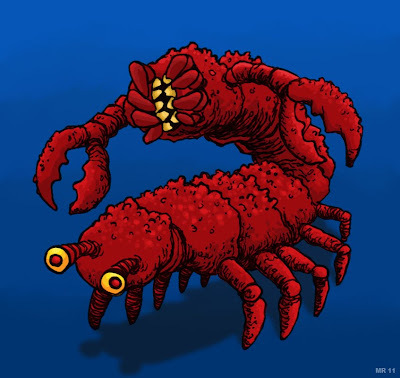 Clawfrongs have been known to excrete a poisonous substance when threatened which causes intense hallucinations. ICBM-X is an artificial intelligence created from the shell of a decommissioned Titan class intercontinental ballistic missile. ICBM-X was created by a Jose "Penuthead" Gonzoles, as his entry into his 7th grade science fair. 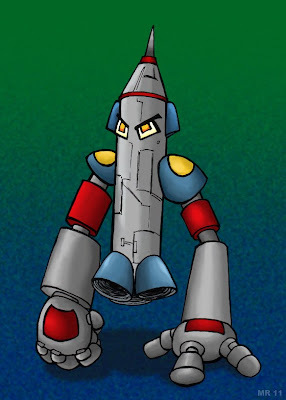 Although he made it to the final round ICBM-X was passed over for the blue ribbon by Besty Bernhard and her genetically engineered super chickens. In his rage and Jealousy Penuthead reprogrammed ICBM-X to extract a horrible and bloody revenge, but the super chickens would not be defeated so easily. After a raging and horrible battle both ICBM-X and the Super Chickens would be disqualified, with first prize going to Wesley McGillis and his Styrofoam-coathangar solar system model. 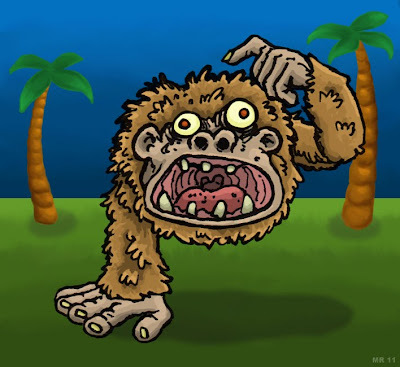 Smookies are a strange, two-limbed primates which inhabit a far away tropical island. The bottom halves of their bodies have nearly atrophied away, leaving very strong front limbs and a short, stumpy torso. 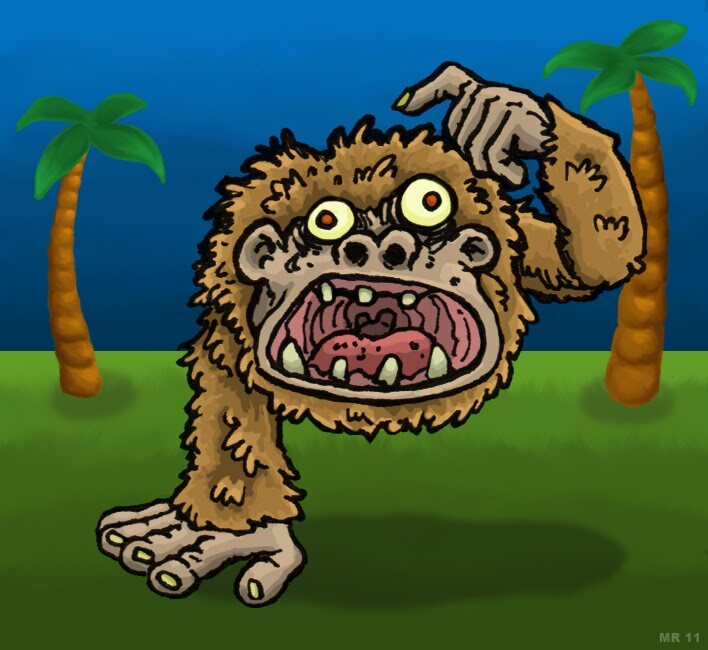 The front limbs are extremely powerful, and are used to help the creatures maneuver through the many trees that cover the island. Smookies are quite intelligent, and have a rudimentary tribal society. Whipipeds are small bipedal creatures, so named for the whip-like tentacle which grows from their heads. 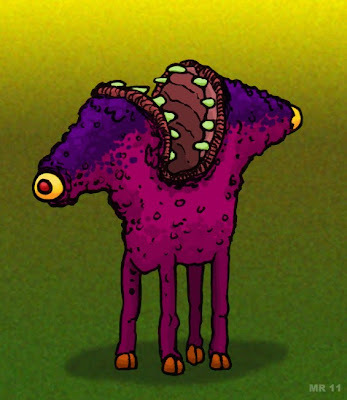 They come in many different breeds adapted to a multitude of environments. 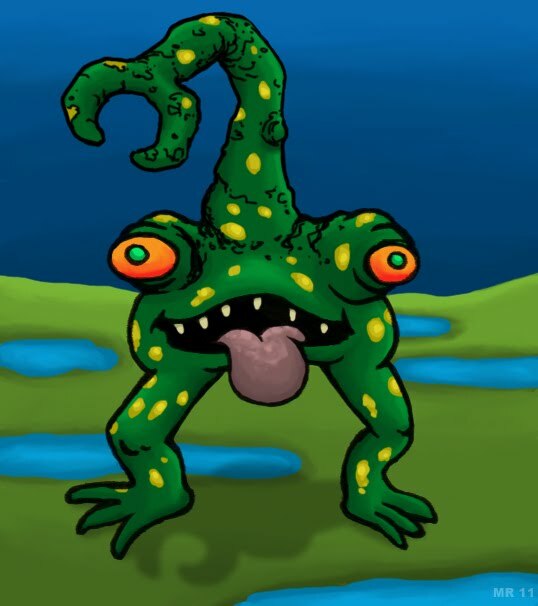 The tentacle is a prehensile appendage which serves as a grasping tool while feeding as well as in a defensive capacity. Whipipeds have no visible eyes, but navigate using the whip-appendage to "read" vibrations and air currents around them. Amon is a Marquis of Hell, the assistant to Astaroth and leader of 40 legions. He procures love and reconciles controversies between friends and foes and tells of all things past and future. Jeremy P. Squirmy was always made fun of as a child for his weak frame and nerdy disposition. As a result he grew up introverted and shy but also highly intelligent. Jeremy's one passion in life was making toy robots. 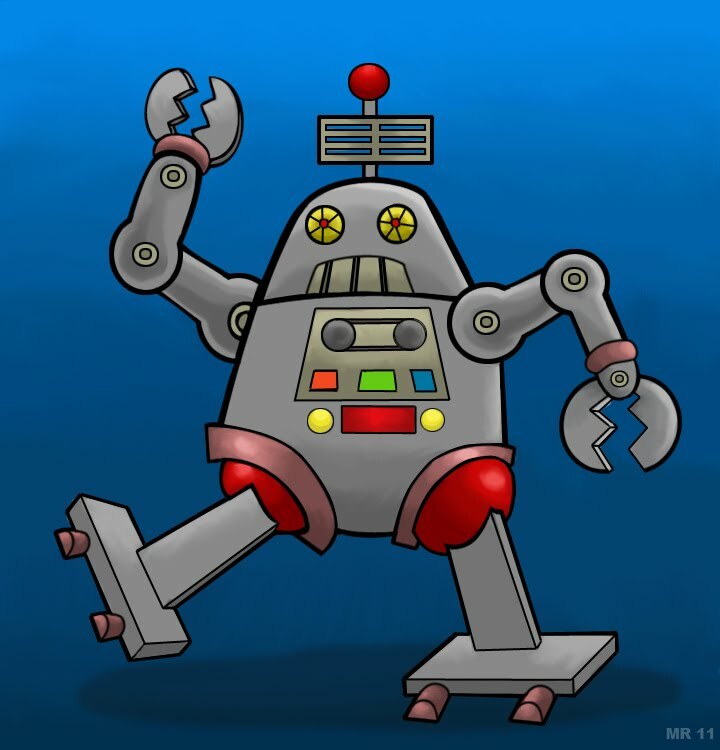 Soon the Squirmy robot toy factory was shipping millions of toys a year. Jeremy finally enjoyed the respect and admiration he felt he deserved for all these years. Unfortunately a run in with some of his old school bullies and a childhood crush left Jeremy beaten and humiliated. 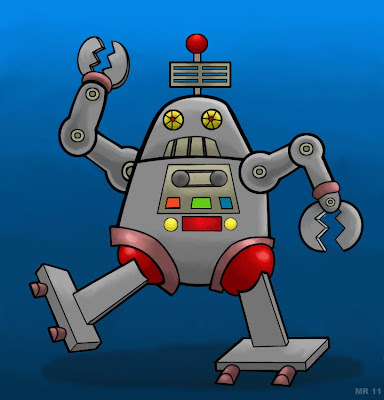 In the darkness of his workshop Jeremy created the Titano-Man, a hideous engine of destruction filled with lethal weaponry to extract his vengeance upon mankind. 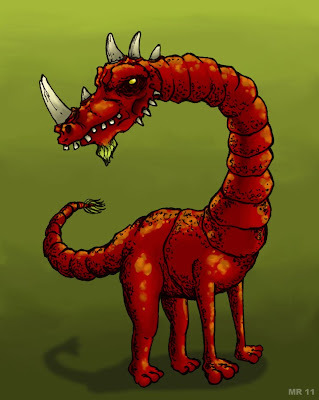 The Dragochririx is a degenerate creature bred from dragons. Eons ago a cataclysm separated an isolated peninsula from the mainland, stranding a very small population of dragons. Over the course of the centuries due to the limited breeding stock, the dragons lost most of their gracefulness and intelligence. The congenital birth defects have compounded so much that 50% of all Dragochririx are stillborn. 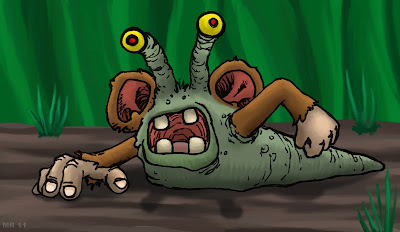 Lenny The Labrat was a subject of terrible and painful experiments, kept in a dingy cage, fed substandard food and generally lead a bleak, hopeless existence. 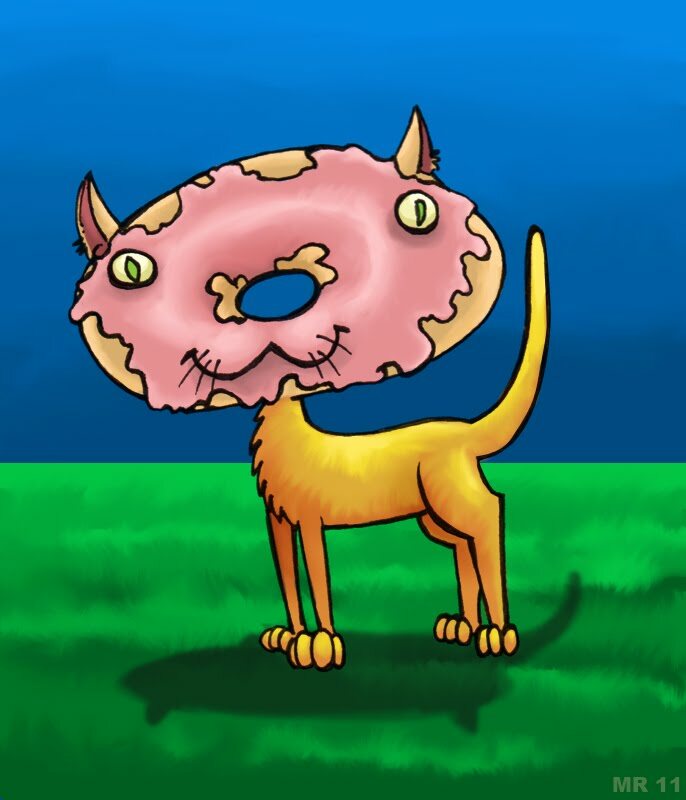 Researchers began noticing a strange increase in body mass and intelligence after Lenny was fed an experimental dietary supplement. The growth continued exponentially until Lenny had increased in size by %5500 percent. 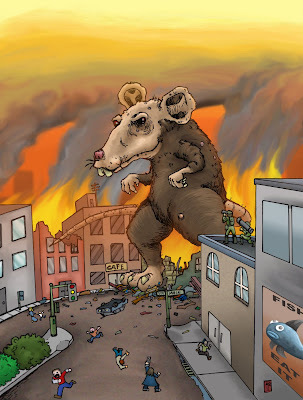 Lenny escaped the lab, and began taking his revenge on the humans for their terrible mistreatment of him. 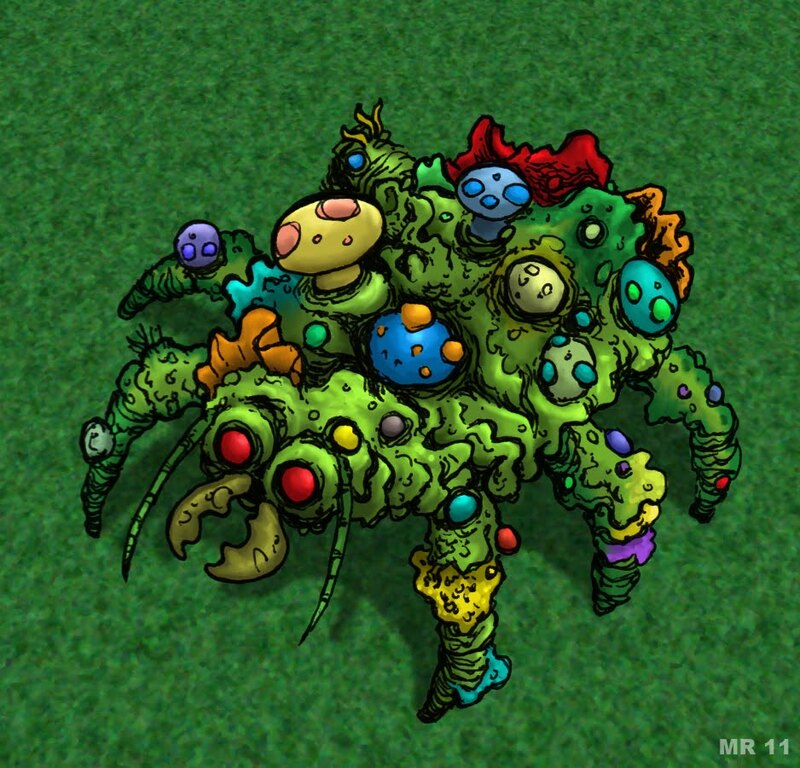 The Anthukabu is an insect which cultivates several different types of fungus on it's shell. 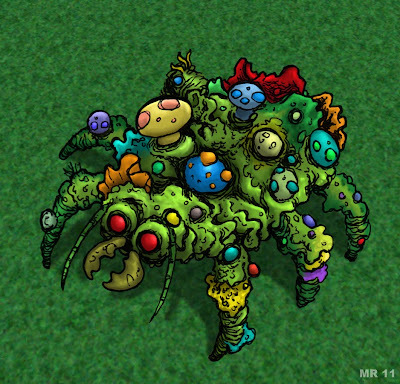 The fungus serves as excellent camouflage, and also as a food source for the creature and it's young. Trobblins are a degenerate race of trolls who were cut off from the larger populations in a secluded valley. 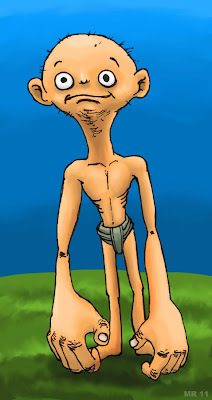 Trobblins have lost all language and clothing making skills, and roam through the forests as wild, naked savages. 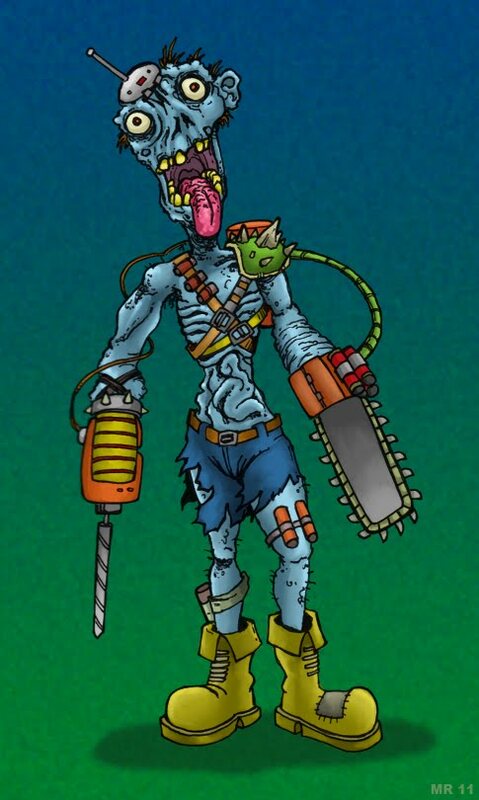 A necroconstruct is a semi-independent being constructed out of dead biomatter (usually corpses) along with various technological implants. As such they can come in any number of shapes or sizes, dependent upon only their creator's ability and imagination. 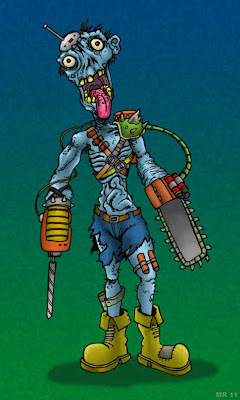 Not zombies in the true sense (as they are animated by science instead of supernatural means) necroconstructs tend to show only the most basic of behavior and motor functions, and as such are usually used as guards, shock troops, or cannon fodder. The process of creating such abominations was originally developed for military use but was later abandoned as too expensive and unreliable. Necroconstructs are most commonly employed nowadays by gangs, druglords, and terrorist organizations. Pandorans are a subrace of humanity. Eons ago a village of cro-magnons were forcibly abducted and relocated to another planet by as of yet unidentified aliens. They were used as manual labor for a few decades but eventually abandoned. As the cro-magnons adapted to life on this strange new planet they evolved in response to environmental pressures - low gravity, differing light spectrum, thinner atmosphere, etc . 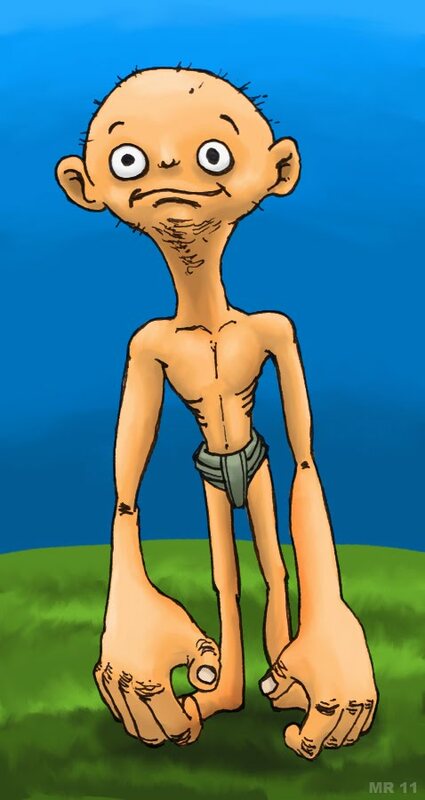 Pandorans today share 98% of their DNA with modern humans, but have evolved to the point where the two can no longer interbreed. A strange breed of cat. 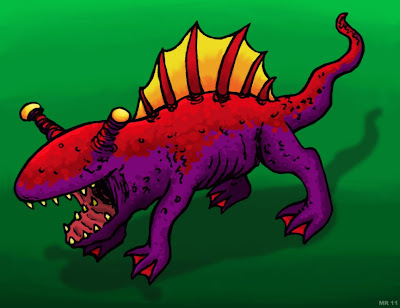 Lobicharix is the name of a rare creature sighted in and around the Mid Atlantic trench. Video of the creatures have been captured by deep sea exploration vessels, but as of yet no specimens have been collected. The creatures seem quite intelligent, and show curiosity towards ROV submersibles. 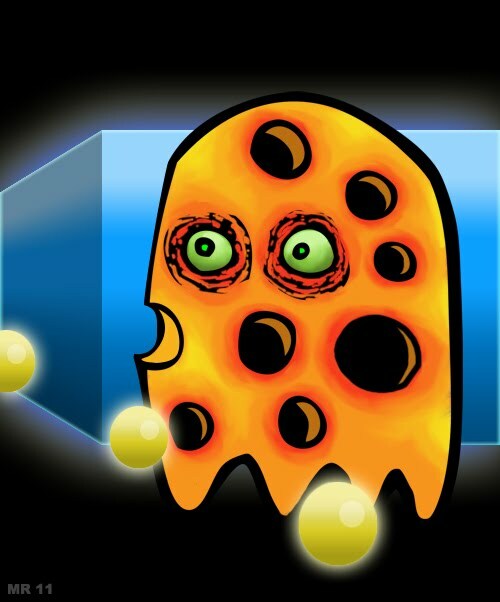 It is theorized they may be a mutation spawned from radioactive waste dumped in the area in the 1960's. Further details about the creature's behavior and habitat are unknown. 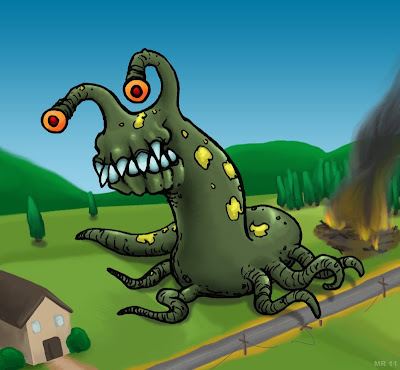 The Sluggusaur is a gigantic hideous mutation spawned from a slug feeding from gigantic plants which were grown from fertilizer tainted with radioactive waste. The Sluggusaur is slow moving but unintentionally destructive. The creature's thick hide makes it nearly invulnerable to all forms of weaponry. 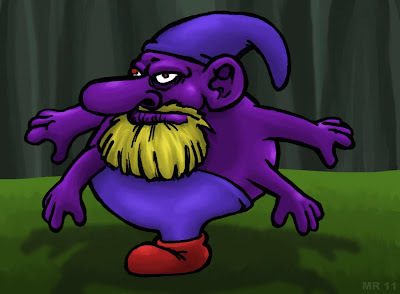 The smogmfs are a race of diminutive people which live in a hidden forest village of mushroom houses. They stand three apples high and use the word "smogmf" interchangeably with any verb or noun, making it hard to communicate with them. 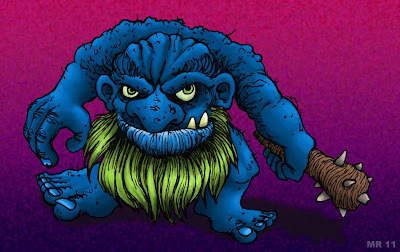 They have vague legends of being descended from similar little blue people who had two arms and two legs, and accredit their current appearance to some sort of magical experiment gone wrong. Mossmite are creatures which have adapted a shaggy, moss-like fur covering which acts as a camouflage. 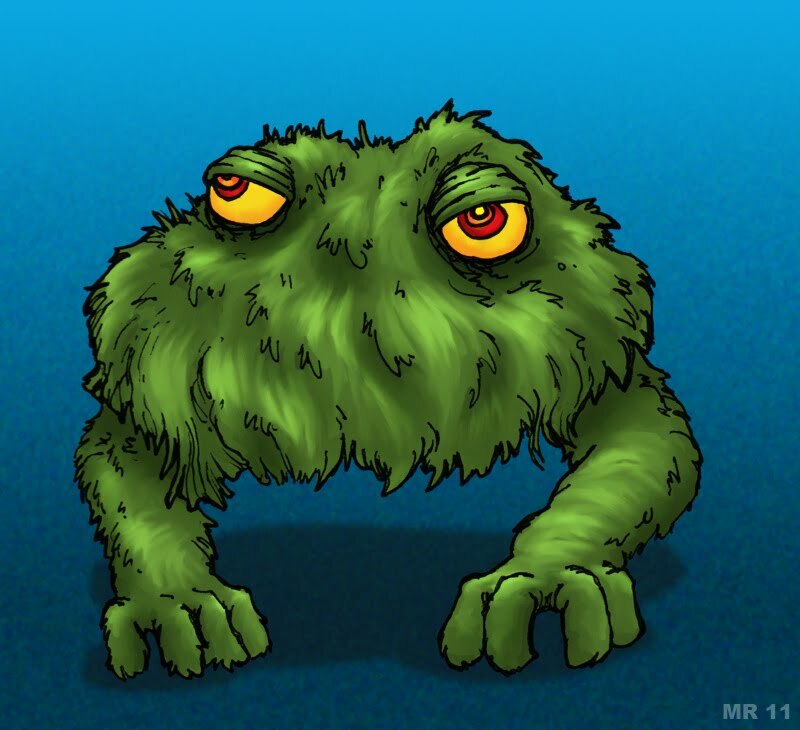 They generally live in swampy or forested environments that have access to large water sources. Mossmites cannot go too long away from water as they can quickly dehydrate. A Squonk is one of the "Fearsome Critters," those strange creatures in American lumberjack-cowboy folklore. The Squonk is a pig-like creature with a lot of warts and too much skin, that which bunches up and wrinkles. It is so ugly that if it happens to gaze upon it's own reflection in a pond or mirror, it cries so much that it's whole body liquefies into tears. 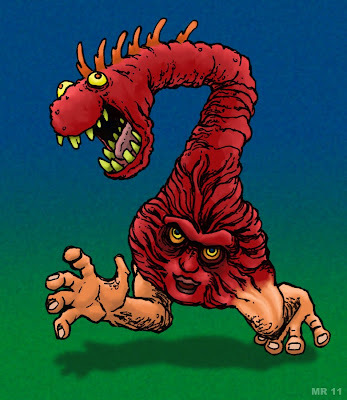 Nerve Runners are the result of parasitic organisms which radically alter a host's DNA, to the point where the creature soon becomes unrecognizable. Symptoms are begin enough in the beginning - headache, cough, runny nose. By the third day the body goes into wild spasms and sharp bolts of pain travel along the nervous system as the transformation begins. As the parasite begins to activate junk DNA in a host's cells multiple mutations may occur. A Nerve Runner may thus have any number of arms, legs, eyes, limbs, faces, etc. The entire body may be radically altered alongside occasional body parts which are relatively unaffected. The host's mental state is another story. Most thus affected are driven hopelessly insane, often turning violent. 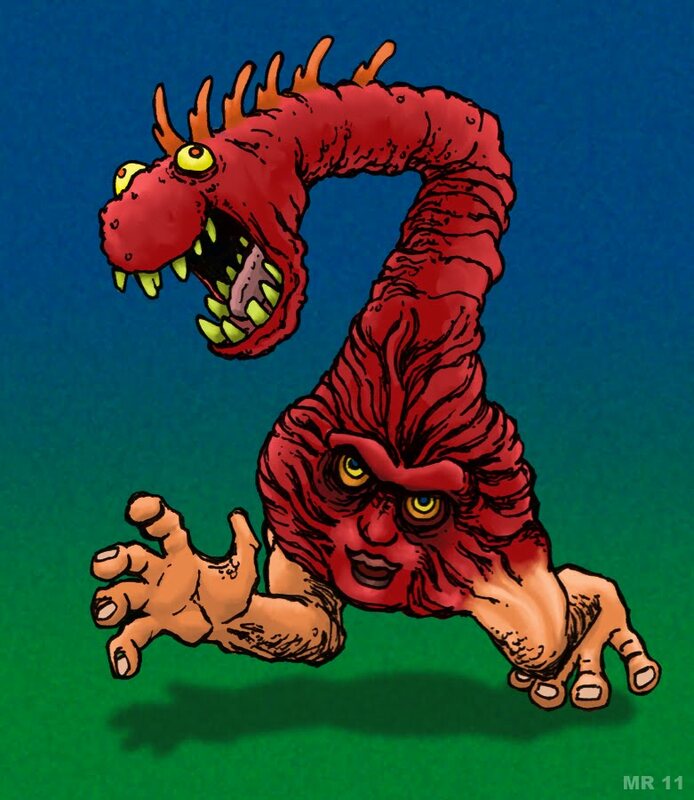 It is theorized this is a mechanism through which the parasite spreads itself.